This Yamaha RD125 ad from 1975 sports the image of one of the world’s best riders of the 1970s. His name is Kent Andersson, a two time 125cc World Champion and to this day the only Swede to have a won a road racing motorcycle world championship. The RD range of Yamaha twin cylinder two strokes are also legendary, and the on track success of Andersson cemented their cult status. The Swedish great had a spectacular career, piloting the sensational small bore 2-stroke Yamahas to 18 Grand Prix victories in 90 World Championship Grand Prix appearances. Andersson finished a close second to Australian Kel Carruthers in the 1969 250cc title chase and was third in the 250cc 1970 season before switching to the screaming 125cc class for 1971. 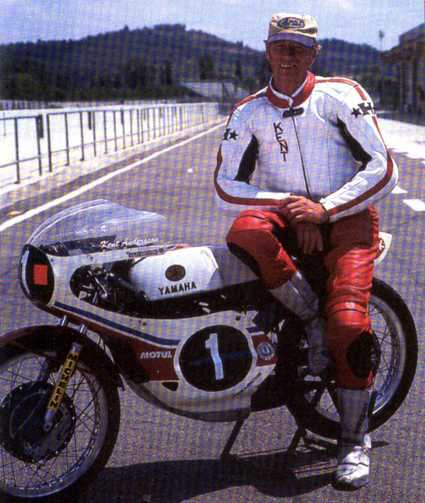 He found his home in the ultra competitive 125cc class and helped Yamaha to develop the YZ623A (125cc bike) for 1971. 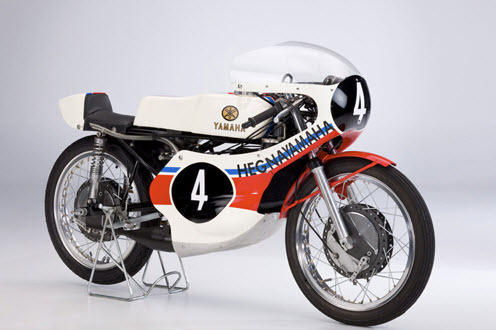 By 1972 the little Yamahas were updated to include water cooling, dry clutches and increased horsepower. More updates followed for 1973 and aboard the bike designated theYZ623C, Kent crushes the opposition by winning the first four races of the season. The title looked a mere formality, but a leg breaking accident mid season puts him out for three races and put his title hopes in jeopardy. He came back to claim second place in front of his home fans in Sweden which was enough for him to be crowned World Champion in 1973. For 1974 the bikes were again improved and the new OW15 was capable of producing 35 horse power at 14 250 rpm and also sported twin front disc brakes. Kent successfully defended his title by taking five wins from ten Grand Prix and in doing so beat superstar Angel Nieto who was at the stage already a 5-time World Champion. Kent is also remembered for taking Michelin’s first ever Motorcycle Grand Prix win in that first race of the 1974 season. Andersson died aged 64 in 2006.